The property is situated in a quiet and secluded position yet is within a 10 minute walk alongside the estuary into Padstow. The property has off road parking for 3 cars and has large lawned front and back gardens. All bed linen and towels are supplied and electricity and gas is included. Broadband is installed. 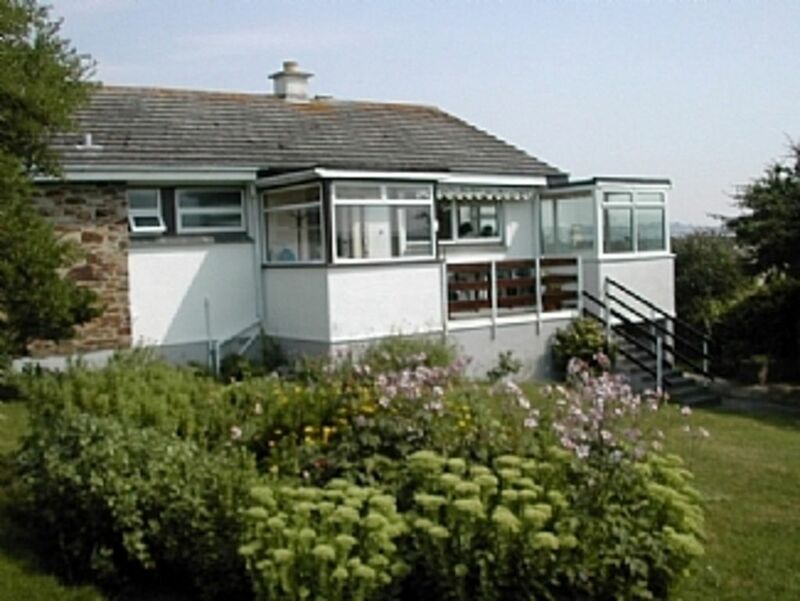 The property is right opposite the famous Camel Trail and offers fabulous sea views . We fell in love with this property as it offered everything we needed in holday home, fabulous views over the water, off road parking, a quiet and private location yet within a 10 minute walk of the harbour for restaurants, pubs and beaches. The property has the dual benefit of being close to the centre of Padstow so it is unnecessary to use a car to access the facilities as well as a private and quiet location. En-suite with shower, sink and WC to master bedroom. Family bathroom with corner bath, shower, sink and WC. Parking for 3 cars on off road drive. Gas hob, electric fan oven, microwave, fridge, washer/dryer and freezer. Fantastic panoramic views of the estuary. There is a small library of books exchanged by previous guests. Balcony with table and chairs offering superb views of the water. Very close to St Enodoc and Trevose golf courses. Notes on accommodation: Gas central heating throughout. The property has been recently redecorated Outside: Detached cottage set in large and private gardens. It offers stunning views of the estuary and Rock from all reception rooms. Gardens: laid to lawn and flower beds at the front and rear. Patio and BBQ area. Off road parking for 3 cars. Utility Room: Tumble dryer, place for outdoor clothes, boots, shoes etc. Cleaning / Towels / Linen / Maid service: Rates include gas, electricity, bed linen and towels. Changeover days on Saturday unless short break during the low season. Other: Sun lounge with dining table, 6 chairs and panoramic views of the estaury and Rock. Lovely property and secure garden in a fabulous location with spectacular views and would recommend and we will return !! Peaceful, private & great location with fantastic views. A wonderful relaxing stay in a warm home with everything needed for a self catering holiday. The reason that 5 stars not given is due to attention to detail in regards to general housekeeping & overall maintenance of the property. This will be our 4th year staying at Waterside (twice a year- June and Sept), which speaks volumes. To find a property which offers parking for 3 cars, a large enclosed garden which our 2 labradors love, stunning views of the estuary and 2 decking areas is to say the least nearly impossible! The kitchen is well appointed and the house is always spotless. The owners are incredibly accommodating always prepared to go the extra mile. We chose to get married last Dec in Cornwall and Waterside was our family's base. Jenny even bought a lovely Christmas tree for the house plus left a bottle of champagne. It's the perfect base to explore wonderful Padstow and the Cornish coast. Perfect location for a stroll into town and enjoy all that Padstow has to offer; a great range of good restaurants, cafes & bars to suit everyone. Clean, comfortable, cosy, practical house with a large, dog-friendly garden & beautiful estuary views. Great place to relax in the peace and quiet & enjoy the scenery. Helpful, friendly owner. Bin Two champagne & coffee bar was a real "find". Would recommend & would go back again. As we stayed here in December the weather was cold but this bungalow is cosy, comfortable, clean and warm and gives stunning views out over the estuary. In general it is well furnished and equipped but we would like to have had a dishwasher and a bigger fridge. We kept milk and drinks outside the back door but this would not work in the summer. It's only a couple of minutes walk in to Padstow and even less to the Camel Trail. Tesco is less than 5 minutes away by car. Thank you for your comments regarding your recent stay in Padstow. It is always good to get feedback so that we may address any issues that arise. We will certainly be looking at the items raised for the coming season. Kind regards. Rick Stein famously loves fish. He believes that 'nothing is more exhilarating than fresh fish, simply cooked' and he should know. He has run the seafood restaurant alongside the harbour in Padstow for the past 28 years. During that time it has grown from a small bistro to become one of the best known restaurants in the UK. An unforgettable experience in an epic location, the Eden project, approx 20 min drive, is both an educational resource and environmental showcase. Padstow's beautifully sandy beach is a short walk from the harbour. A larger beach is available at Rock which can be reached by a short ferry ride from Padstow harbour. Newquay airport is within 30 minutes from Padstow. Within an easy 10 minute level walk of the harbour and restaurants. Booking Notes: If you wish to book, please send an email or telephone. The requested period will be reserved for you and a booking form will be sent. Return the booking form with a 20% deposit, the balance due 6 weeks before your stay. All receipts will be confirmed. Changeover Day: Changeover day is Saturday unless it is a short break in the low season when the changeover day can be flexible. Notes on prices: Prices are for the property per week in UK Pounds and include the provision of gas, electricity and all bed linen, towels. Broadband installed.